Evernote has a long and storied history. It once reigned as king of note-taking services, successfully blossoming in an increasingly mobile world. But as the service grew larger, it became a less efficient tool for the core task of viewing and creating notes. New features and tangential apps added over time created bloat and became distractions. For a time, there weren't many worthwhile alternatives for Apple users to explore. That changed in June 2015, when Apple introduced a revamped Notes app for iOS and macOS. 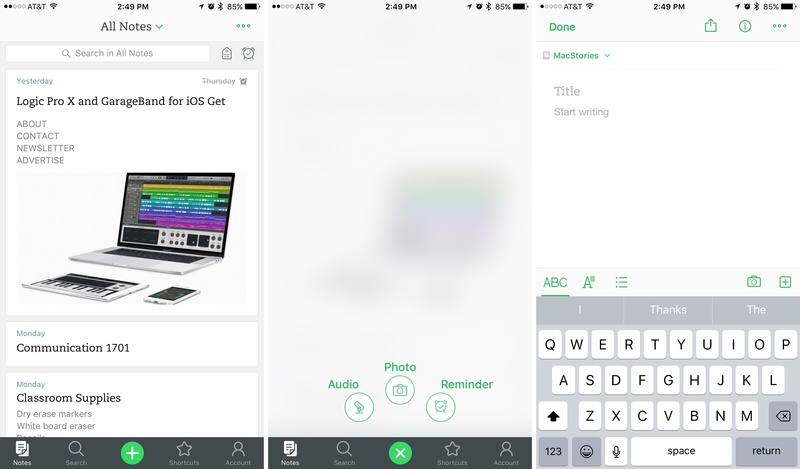 I'd been unhappy with the clunky state of Evernote at the time iOS 9's Notes was unveiled. My experience with Notes in the past had been frustrated by poor syncing that led to data loss on multiple occasions. But what Apple demonstrated with Notes' overhaul looked promising, and I gave it a shot. Notes has kept me satisfied since its big update, and I know many people are in the same boat. But Evernote recently launched version 8 of its iOS app, which led me to give that service another try. At first glance, Evernote 8 is similar to past versions. The more time you spend with it, though, the more substantial an update it proves itself. Visually, Evernote looks every bit like a modern iOS app.1 Whites and grays dominate the color scheme, with the app's hallmark green sprinkled throughout. Notes are presented as cards in a vertical list, and swiping one to the left presents buttons to star, add a reminder, or trash the note. The card design with options on swipe imitates Apple's News and Mail apps in iOS 10, and works well as an interface for managing notes. From left to right: Evernote, Apple Mail, Apple News. The vertical Note List can be customized to best suit each user's preferences. Tapping the ellipsis at the top of the All Notes screen presents you with a number of options.2 There are Small, Medium, and Large display options for notes in your Note List, which changes both the amount of text previewed as well as the size of image thumbnails. You can also choose a highly-compact view without any body text or images at all. Lastly, sorting options allow you to sort notes by date updated, date created, or note title. 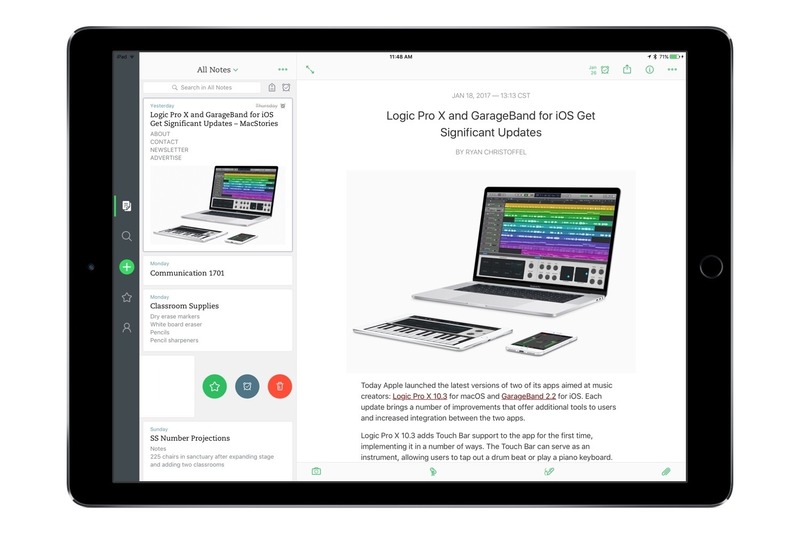 When Evernote announced version 8 of its iOS app, they said the redesign focused on speed and simplicity. Over the last two weeks of use, speed has been a mixed experience for me. In the first several days, it felt fast. Truly fast, as in, night and day compared to past versions. For about a week, though, things grew progressively slower. But just recently, the app's reverted to its snappy form. It's difficult to say what caused the speed variances, as they took place during times when the app version and OS version didn't change. In any case, I'm happy to have a fast app again, and hope it stays that way. Evernote's focus on speed and simplicity produced not only a more responsive app, but a better organized one as well. The layout of Evernote 8 successfully helps users access notes or create new ones with as few taps as possible. Quick access to notes is enabled by a number of design choices. First, search options are prominently available. In the Notes tab, the top of the screen contains a search bar that searches within the context of the current viewing. For example, if you're viewing All Notes, it searches everything, whereas if you're viewing a particular notebook, it'll only search in that notebook. Just right of this search bar are options to filter your current notes view to only notes containing certain tags or a reminder; if you use those features, it's even easier to find what you're looking for. Left: Notebooks drops-down menu; Right: Shortcuts tab. My favorite search option is the dedicated Search tab. When you open Search, the search box is automatically selected so you can begin typing your query immediately – no further taps required. Search results appear instantly with each keystroke, divided into helpful sections of Notes, Notebooks, and Tags. The Search tab also contains a list of recent searches, so with just a tap you can repeat a previous search. For a note-taker that's built to house a huge amount of data, search is a crucial area to get right, and Evernote excels here. The second way to quickly access notes is by using the Shortcuts tab. You can add a star to any of your notes, which adds them to a list of Shortcuts. In addition to housing all your starred notes, the Shortcuts tab also contains a list of Recent Notes you've accessed. This makes it one of the best places to quickly access a regularly visited note. Creating new notes can be done from any screen in the app thanks to the ever present green plus button. Pressing this creates a new text note, but you can also long-press it to receive options for creating a new Audio, Photo, or Reminder note. On devices with 3D Touch, you can also create a new note by pressing firmly on the Evernote app icon from your Home screen. Many people who formerly used Evernote have grown content with Apple Notes, so I thought it would be helpful to take some time evaluating the two apps side-by-side. When it comes to writing notes, Evernote and Apple Notes have a number of tools that overlap. Both contain simple bold, italics, and underline options. Both allow easy creation of various lists: checklists, numbered, and bulleted. Sketching tools with Apple Pencil support are available in both apps. 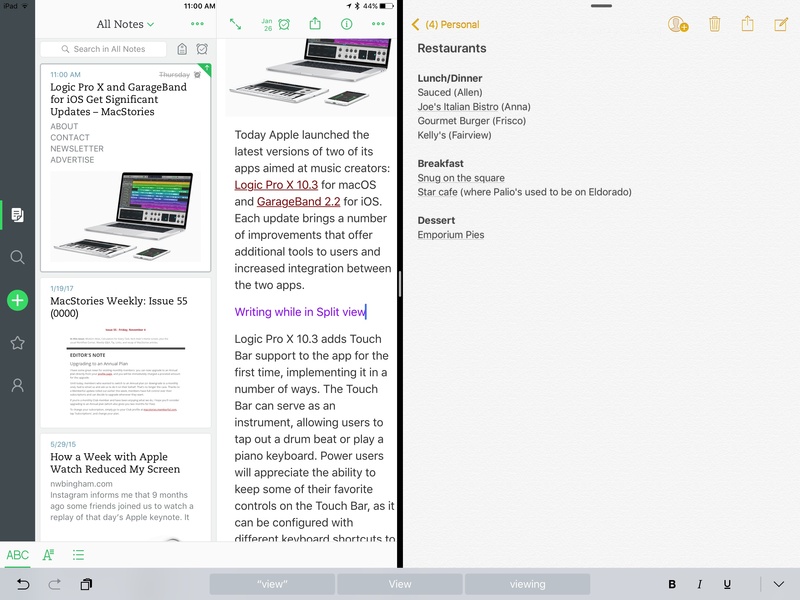 Apple Notes has a couple heading styles that are missing in Evernote, but it has few other tool advantages. The main differences between the two apps in this department are tools Evernote has that Notes does not. Evernote has more options to customize text, with strikethrough, highlighting, and the ability to change font size.4 One of my favorites is the option to use colored text, which helps me visually distinguish between different portions of a note. I find this particularly helpful when composing teaching notes, as I can use different colors for things like questions or quotes in my outline. 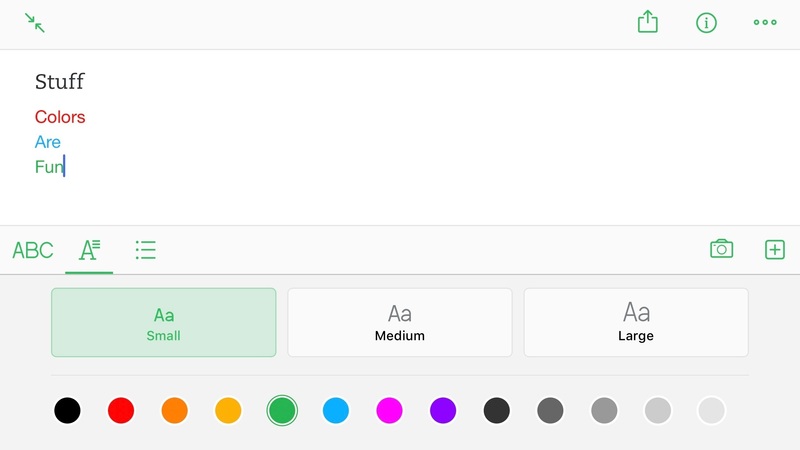 Evernote has a myriad of color options for text. Both apps can add photos to notes, but Evernote has better tools for scanning paper into the app. By using the technology behind Scannable, Evernote creates a big draw for anyone who regularly needs to scan documents. Files can be attached to notes using Document Providers from within Evernote. Apple Notes doesn't allow attaching files, except with its share extension. One downside in Evernote is that most file types don't have rich previews inline – they simply show the file name and type.5 Interestingly, a rich preview is shown in the Note List when certain files are at the top of a note. PDFs show rich previews in the Note List, but not in the note's body. Voice memos can be created directly inside of Evernote, while Notes only supports adding voice memos from an external app. If you use an external keyboard, Evernote has more keyboard shortcuts than Apple Notes, too. Evernote is more effective than Apple Notes at organizing your notes. First, there is still no way to reorder folders in Apple Notes on iOS, nor can you create sub-folders. Creating sub-folders is possible on the Mac, so its absence on iOS is especially curious. 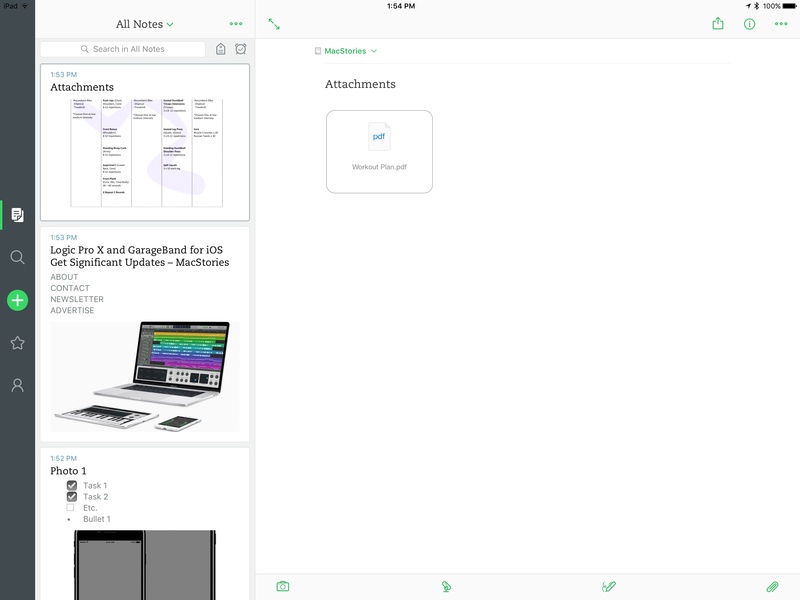 Evernote lets you add notebooks to a stack, which essentially makes them sub-folders. Changing the sort order of notebooks isn't possible in Evernote, but it's less of an issue due to the Recent Notebooks view. Notebooks can also be added to the Shortcuts screen, allowing you to view only a select few at a time. Basic options for renaming folders and creating sub-folders are long overdue in Apple Notes. One nice option in Evernote is the ability to add a reminder to a note. Unlike in Apple's ecosystem where reminders lives separate from notes, Evernote combines the two in a way.8 Notes marked with a reminder can be assigned a specific date and time – when that time comes, you'll receive a notification and the note will be pinned to the top of your Note List. Notifications contain action buttons: Snooze, Mark as Done, and View. I've found reminders a helpful way to keep track of any notes that are works in progress and stay on top of things. Perhaps the most significant benefit Evernote has over Apple Notes regarding note organization is its use of tags. In addition to being organized by notebook, notes in Evernote can be assigned one or more tags. Some people employ tagging more than others, but there's no denying it's a nice option to have. Notes holding a specific tag can be found quickly through search or through filtering notes by tag. Since the early days of Evernote, tools like the service's web clipper made it easy to get content into Evernote without needing to open the app. On iOS, the share sheet fills that role. 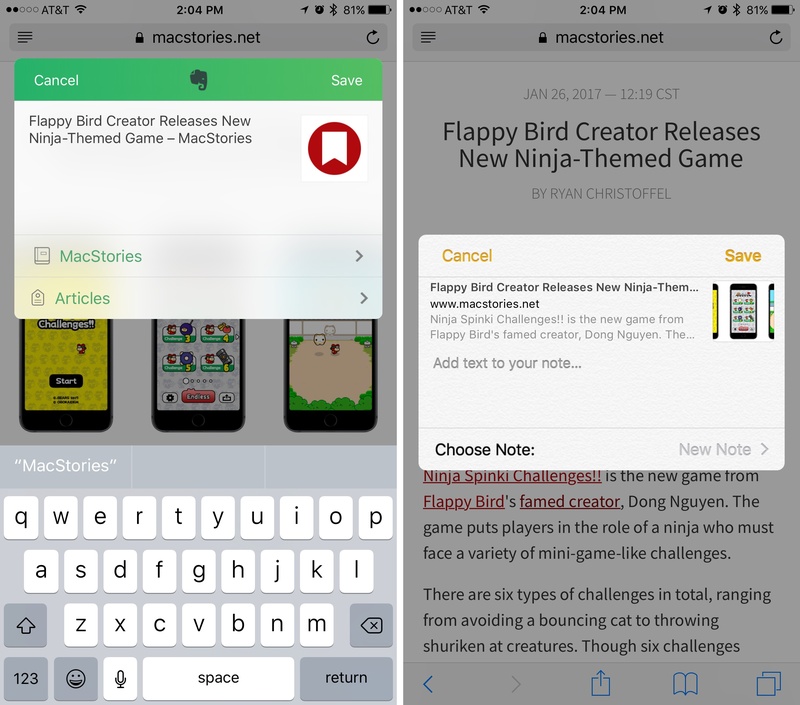 Invoking the iOS share sheet can present a couple different extensions for Evernote. The standard extension, simply labeled 'Evernote,' is most common and you will likely find it most useful. Selecting it presents a list of ways to save the file in Evernote. You can select the notebook you want the file's new note added to, as well as attach tags to it or write additional text to go with it. After selecting the options, tapping Save sends the file to Evernote without needing to leave the current app. Depending on the type of content, you may see a second extension option: 'Import to Evernote.' This extension presents no menu of options to modify, but instead immediately takes you into Evernote, where a new note is created with the file attached to it. I could see this working best if you use a GTD-style method of processing notes with an Inbox that is designated as your default notebook. Evernote's share extensions do not provide the option to append anything to an existing note, only create new notes. This is an obvious area that Apple Notes handles better; adding files or links to existing notes is something I do all the time. 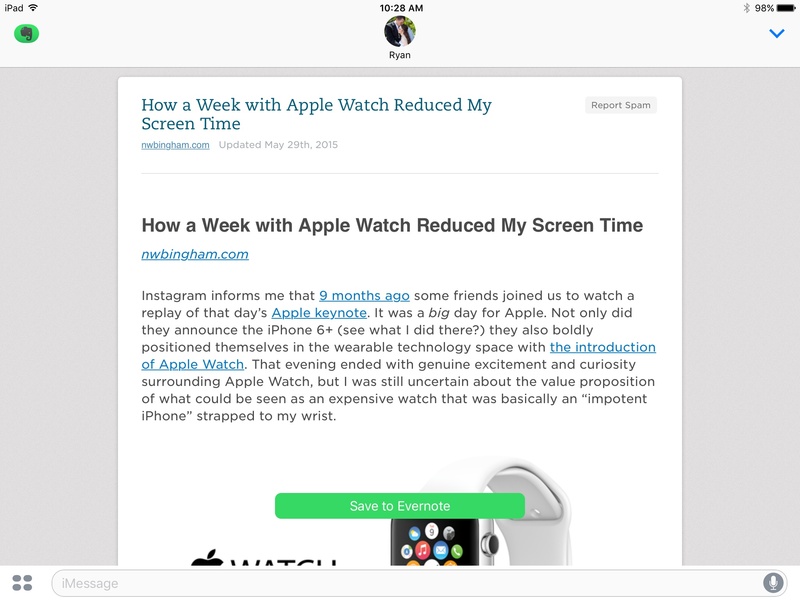 After content has been sent to Evernote through a share extension, it's displayed in notes differently than in Apple Notes. Links feature perhaps the most significant divergence. Share sheet comparison when saving a website. 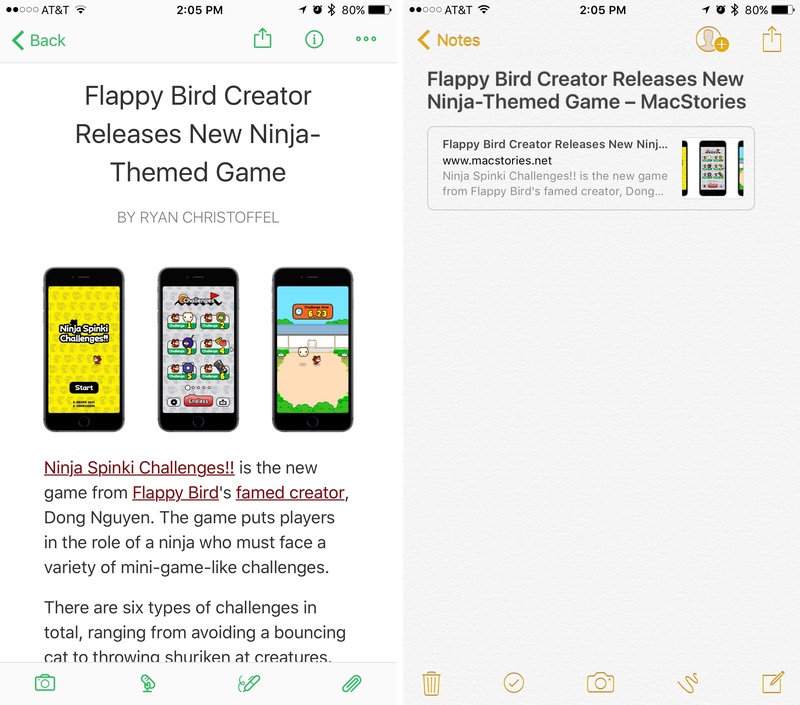 Apple Notes presents links as nice-looking rich previews that include a thumbnail, if available, as well as the linked site's title and part of its body. Evernote goes an entirely different route, saving the full content of the linked page into a note. The note will include full text, images, links, etc. from the page in question, all presented with formatting that's nearly identical to the source page. It's almost like saving a webpage as a PDF, except that the entire contents of the page are imported to Evernote in editable form. The resulting notes when saving a website. As mentioned earlier, other types of files like PDFs don't receive inline rich previews in Evernote, but they will be previewed in your Note List if they're near the top of the note. Apple Notes provides both the option to view previews, and the option to simply see the file name and type. One area where Evernote excels is integration with Workflow. Because Apple Notes contains no web API that's open to developers, its only Workflow action is Create Note. Evernote, on the other hand, contains a number of Workflow actions that largely make up for the deficiencies of its native share extensions. The most valuable Workflow action in my mind is Append to Note, which includes the option to append or prepend to specific notes. The vast majority of the time that I append to notes in Apple Notes, it's to one of a handful of specific notes, so needing to create Workflows that correspond to specific notes isn't an issue for me. Evernote and Apple Notes both have different strengths in the area of share extensions, so the one you prefer will likely depend on your own needs, and your preferences about how content appears in notes. If you don't mind using Workflow's extension at times rather than a native Evernote extension, Evernote generally has more to offer in the area of getting content into it from other apps. 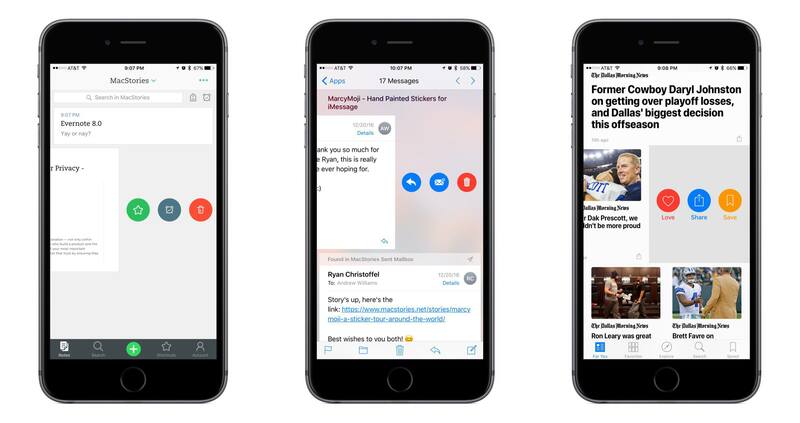 In a way, Evernote is a better citizen of the Apple ecosystem than Apple Notes: it has apps for both Apple Watch and iMessage, while Notes supports neither platform. 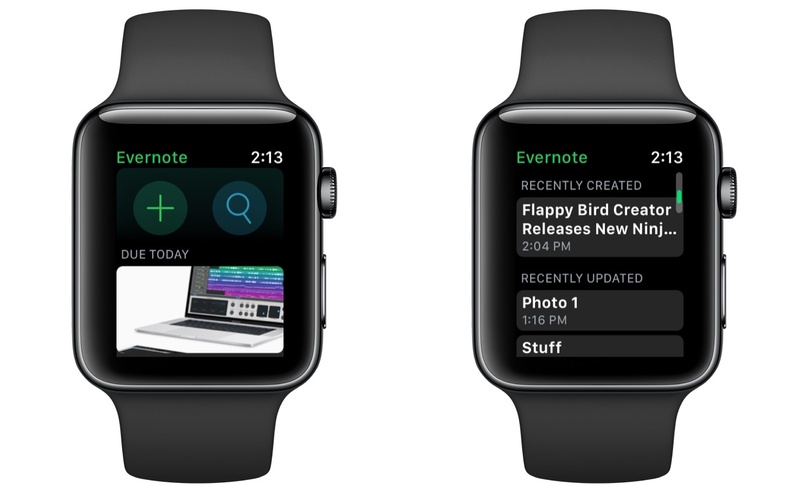 Evernote's Apple Watch app is one of the most impressive third-party apps I've seen. Particularly on my Series 2 model running the latest version of watchOS, the app flies. Evernote's app is extremely simple, as any good Watch app should be. There's one main screen that begins with two action buttons at the top. The plus button allows creating a new note via dictation, which will then be saved to your default notebook. 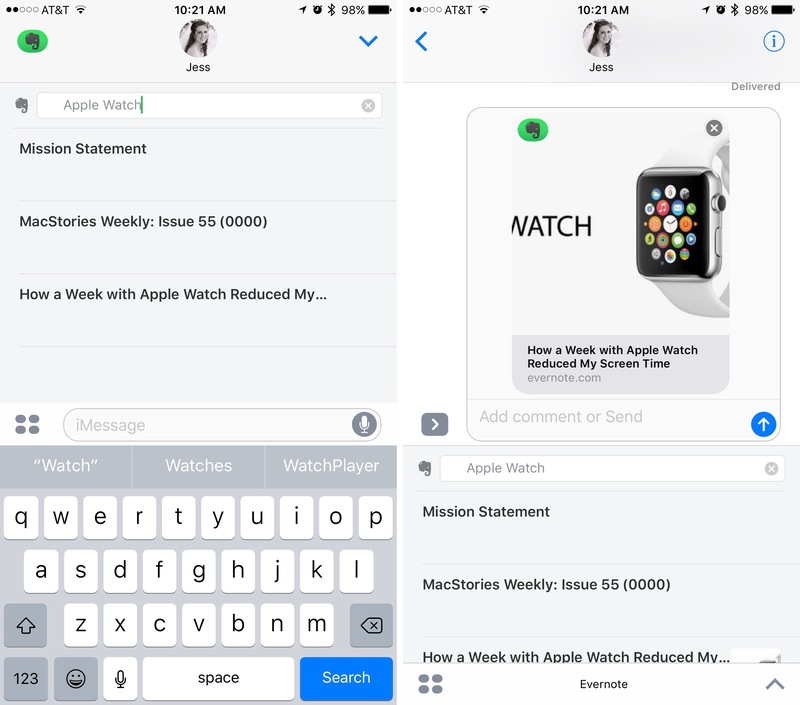 The search button searches for a note via dictation or by using watchOS 3's Scribble feature to write out your search. Recent searches are also listed so you can simply tap to complete a past search again. Below the plus and search buttons is a list of notes, each of which can be tapped on to view its contents in full. The app does not show your notebooks or every note you have, but instead presents recent notes or notes with reminders that are due soon. If a note doesn't fit in one of these categories, you can still access it in the app using the search option. Viewing notes in the Watch app is a solid experience, with scrolling handled by the Digital Crown. Notes with plain text work well, but so even do notes with photos in them. I even opened a note containing the full contents of a web page, and it loaded just fine. Formatting was lost, but all the text was left intact. If you're viewing a note and would like to create a new one without going back to the main screen, you can Force Touch to see a 'New Note' option. Some may consider the idea of reading notes on an Apple Watch silly, but I've found it useful in practice and the Evernote app has quickly become one of my most used third-party Watch apps. The only negative I'll mention is that there's currently no complication available to quickly launch the app from your watch face. 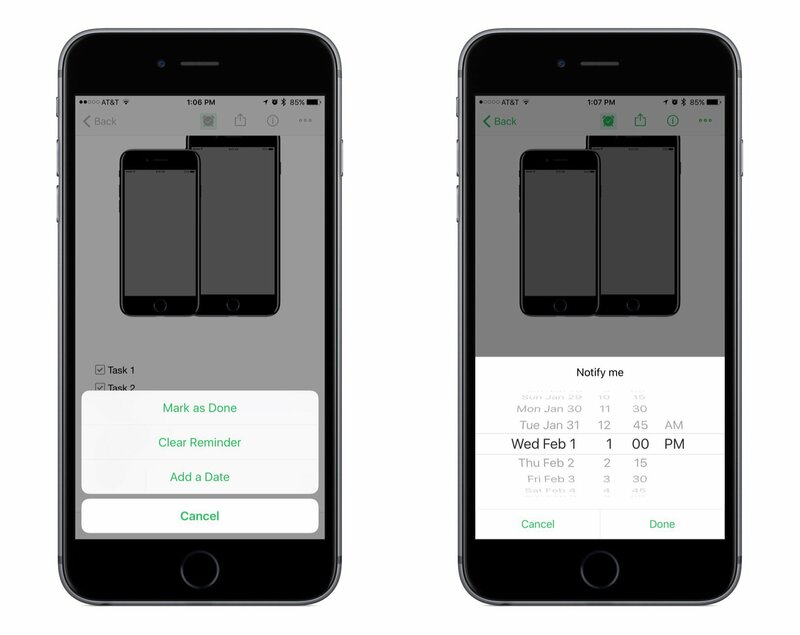 Evernote's iMessage app presents a list of recent notes you can send to friends or family members. If the note you're looking for isn't immediately available, that can be solved by the app's included search option. If the person you send the note to doesn't have Evernote installed, they'll have to download it before viewing the note. Once Evernote is downloaded, nothing else needs to be done. Full notes can be viewed from the Messages app, even without an Evernote account; saving a note, however, requires one. A note sent through iMessage, from the recipient's perspective. There are a few areas where Evernote and Apple Notes are comparable. They both have landscape support on iPhone Plus models, which allows working in a note while the navigation pane is still visible. They both have similar widgets, where the limited view contains the most recent note, while expanded view shows the three most recent notes plus a set of four action buttons. Collaboration is available in both Evernote and Apple Notes. Evernote's Work Chat feature is not as prominent as it has been in past versions on iOS, but it still exists. Either app may be more useful to you for collaboration depending on whom you're collaborating with. Apple Notes comes pre-installed on iPhones, iPads, and Macs, so if you're collaborating with someone who works on those devices, collaboration is quick and painless. If, however, you're collaborating with an Android or Windows user, Evernote may be more appealing. It requires every collaborator to have an Evernote account, but is available on a wider number of platforms. If you work much from an iPad, the various layout options of each app will likely interest you. Apple Notes added a three-panel view in iOS 10 for the 12.9" iPad Pro, which I find tremendously useful. 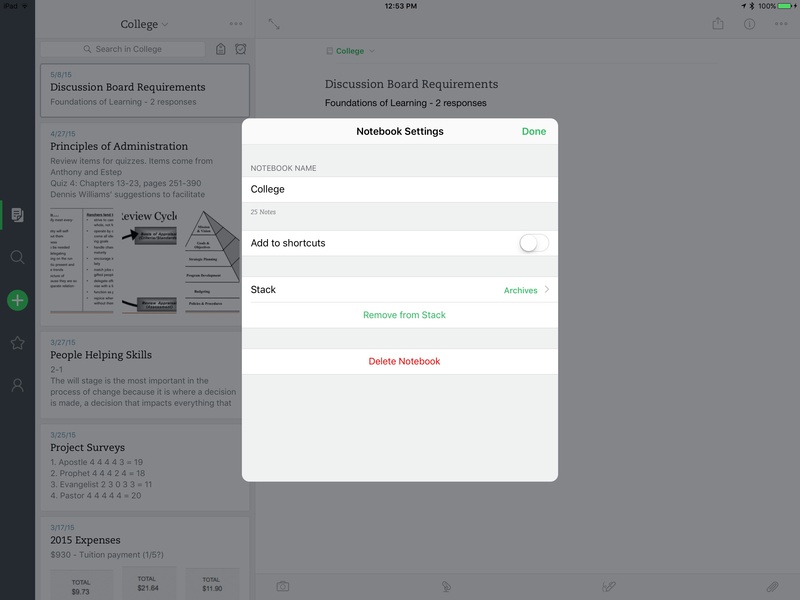 Evernote is organized differently than Notes, so it's difficult to make comparisons, but it offers some nice options to iPad users as well. 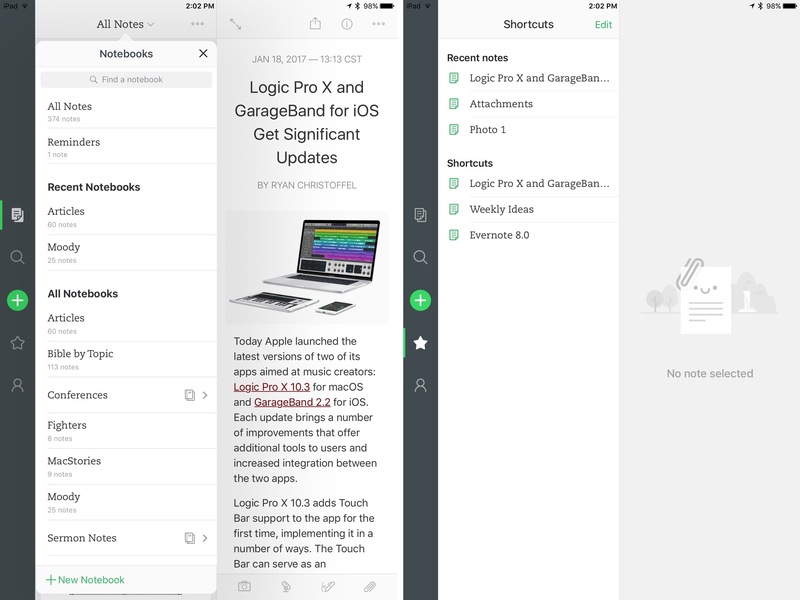 Evernote provides better Split View options on iPad. While in 50/50 Split View on the large iPad Pro, Evernote users can view the full app's interface while writing in a note. The main navigation bar, the Note List, and your current note are all visible at once, and you can write while they're all visible. Apple Notes is a different story entirely in 50/50 Split View. If you want to write in a note, the note is all that can be visible. You either write or view your note list; doing both is impossible. Note Taker, or Digital Brain? Apple Notes has always had fewer features than Evernote, but for many people, that is seen as a bonus in some respects. In days past, Evernote grew bloated and clunky with all its features, abandoning its roots as a quick, convenient hub for notes. Personally, Evernote's slowness, in app launching and navigation, was the primary reason I switched to Apple Notes. Evernote's features have remained largely the same, but the implementation and organization of those features is greatly improved in version 8. The app doesn't feel bogged down by extra tools; rather than getting in the way of creating or viewing notes, Evernote's tools enhance those tasks. If you're an Apple Notes user and all you want is a basic note taker, Evernote 8 may not offer enough to tempt making a change. Apple Notes does what it's supposed to do well. Evernote 8 is a solid note taker, but its greatest appeal – to me at least – is that it strives to do more. Evernote is a service that aims to become your digital brain – an intelligent brain that stores anything and everything you throw at it, makes that data all quickly accessible, and creates connections between notes and the digital world that Apple will likely never do. Some of these tasks it already handles well, but its greatest potential is found in developing a brain that grows smarter in the future with machine learning. I haven't decided what place Evernote will have in my life going forward, but regardless of whether it supplants Apple Notes, I'm hopeful that brighter days are ahead for the service. 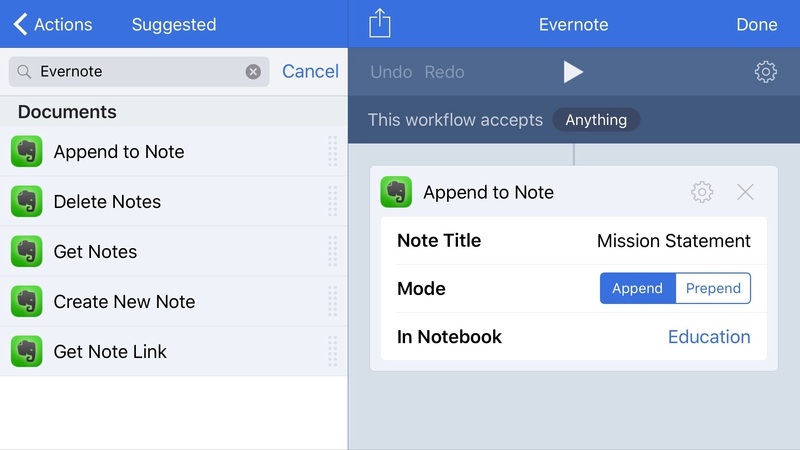 After iOS 9 brought a revamped Apple Notes, I stopped paying attention to what Evernote was doing. The latest release shows a company driven to become relevant again, and they have earned my attention.